Hi loves! How are you today? Are you as glad as I am it is Friday? This week would NOT get by, really.. sometimes it just takes forever in your mind LOL. Today I have a manicure I absolutely LOVED and even wore for 2 days (I normally always wear everything just a day). 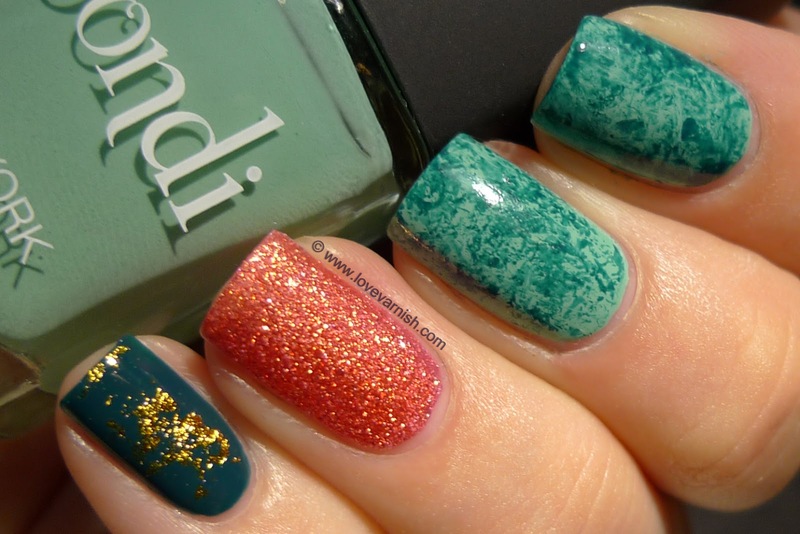 It just had so many of my favorite elements: Bondi Lady Liberty, a teal color, golden sparkle and a texture polish. It just all came together for me. The golden foil is nail foil that the lovely Marta sent me to try out. I must say I quite like the effect! It is sooooo sparkly and, once you get the hang of it, not THAT hard to use. So let's take a look at each nail, shall we? Thumb - Ciaté Superficial (2 coats), golden nail foil. 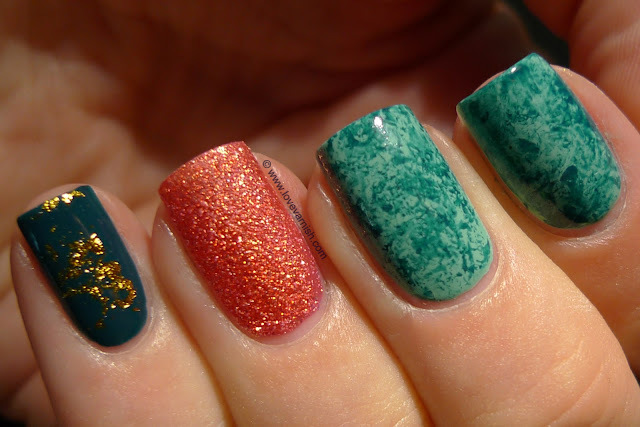 Index & middle - Bondi Lady Liberty (2 coats), saran wrap marble using Ciaté Superficial. Ring - OPI Jinx (2 coats). Pinky - Ciaté Superficial (2 coats), golden nail foil. The saran wrap marble is such a lovely technique, I totally rediscovered it this week and have used it 3 times again already! The foil was attached by painting my basecolor, letting it dry, then use 1 coat of a regular clear polish (so nothing fast drying!). Then, when the clear coat is ALMOST dry, carefully put down the foil there where you want it. In my case, random patches. You use the ugly side of the foil, not the good side. After the foil is applied you can topcoat it. So, do you like this skittlette manicure? And which nail is your favorite? Looooooove it! SaranWrap nails are definitely my fave, but I'm in love with the whole manicure itself, your combos are always amazing! It is a good combo right? Thanks :). Beautiful combination. I love the dark teal with Jinx! Thnaks Amanda! They have a great contrast :). Thanks Gwenn! And great to see you here ;).